Determined to finally make some use of out my extravagant Union Society membership, I went to see Lord Levy give a speech there last night. (The BBC mention it for the fundraising angle, though The Cambridge Student were better – I’ll link to them when it comes online.) Obviously, I had only heard of Levy in relation to all the honours controversy, and he did promise to “have some fun” with the issue after talking about the Israel \ Palestine situation first. Which, after all, is rather more important. Levy makes a good speaker – with a thoughtful analysis of the problems – and also slamming the Bush administration for neglecting the issue for seven years, and Bush’s personal failure to visit. The questions afterwards – which were pleasingly thoughtful, incidental – led to a rather exclusive opportunity: hearing Levy turn on the schmooze to role-play in trying to raise money from one of us for the Oxford debating society, which are apparently in financial problems (hah ). And to be fair, he wasn’t Blair’s top fundraiser for nothing: I even felt an urge to rush forward with money, though I managed to suppress it. He’s good though. Charismatic and charming. I don’t know why these events always have to attract the odd ridiculous question though. For Jack Straw, it was the guy who demanded ‘human rights for Muslims!’ without offering much of an explanation other than an angry tone of voice. For Levy, the guy who insisted that terrorism wasn’t a big issue ‘because lightning kills more people’ irritated me, for being self-evidently stupid. There’s an important point lurking inside the twisted formulation – on the potential to use terrorism to achieve other ends, but there is a point when grandstanding presentation and idiotic phrasing renders you nothing more than a fool. Now, moving on! Salt. Ghandi Gandhi [see comments] may have marched for it, but I think even he would have recognised its limits. So what do we make of this shocking undercover picture? now then, firstly there is CLEARLY no evidence to suggest that this white salty goodness belongs to me… and even less to suggest the ways in which it is consumed. ahhhhhh sophie…. 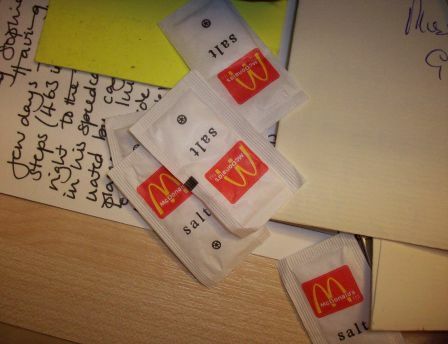 salt is really bad 4 u… it can damage ure kidneys….m8 ure a cambridge student…. come on! lol! any whooooooo….. didnt understand the rest of whole blog, so skipped to the pictures….! !